An exciting adventure began this morning in Armidale with Pathfinders staff, along with some of our young people from Armidale, Inverell and Glen Innes. 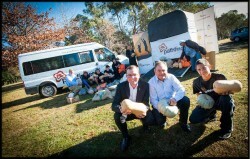 Five hundred pumpkins harvested from Tilbuster Station will be delivered to refuges in Sydney tomorrow. Member for Northern Tablelands, Adam Marshall farewelled the crew from Armidale after some photos and packing of the pumpkins into a horse float, next stop Tamworth! After some lunch and a visit to Kevin Anderson, Member for Tamworth they are all on their way to Sydney to cook pumpkin soup and distribute the pumpkins at the Oasis Youth Support Network in Surry Hills tomorrow with the help of YFoundations. This is an exciting time for our youth and an opportunity to give back to the homeless and disadvantaged of Sydney and to show the ‘big smoke’ what their country cousins can do! !